The image is Flowers from Cocoa and as many of you know, Cocoa is one of my favorite from SNSS. I created a pocket using an SVG File (Library Card Holder) from Penny Duncan. I did alter it a bit by removing the flourishes because they were much too fancy. It's also not supposed to fold down, but I added a score line to make it a pocket. It will have a bookmark and bookstore gift card in it for my Mom. Here you can see the full image. I took a tip from my friend Joni to use black behind my white cards. It really does help bring out the colors and it looks fabulous! And here's the fold over. I created the sentiment on my computer. 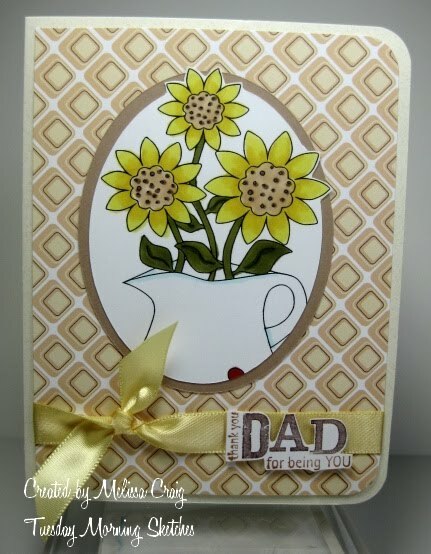 The flowers I punched out and then ran through my Cuttlebug with the Swirls Embossing Folder. I didn't complete the bookmark - I started making one and then my youngest son was the one to discover that it wouldn't fit in the pocket, so I am back to the drawing board on that one. I hope you like my pocket card. The challenge I'm entering this in is for Just Us Girls (I'm too late to enter, but I'll share it anyway) which was to use a template. I think the SVG holder qualifies. I'm also entering this in Digital Tuesday Challenge which is to create anything but a card. Since this a pocket holder, I think it qualifies there, too. Thank you for stopping by! I hope you have a great Friday! Good Morning! I'm finally here to post today's entry. Last night was a very busy night for me so I didn't get my card done until late and I was too tired to set up the blog post. 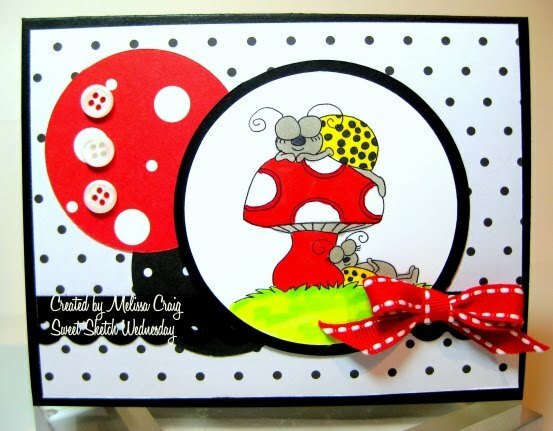 This week's card is using the new set by Lindsay called Crafty Tools & Puns set and I did this card with my sister in mind. She just recently took up knitting so this was perfect for her! I love the sentiment! This is mine... sort of. 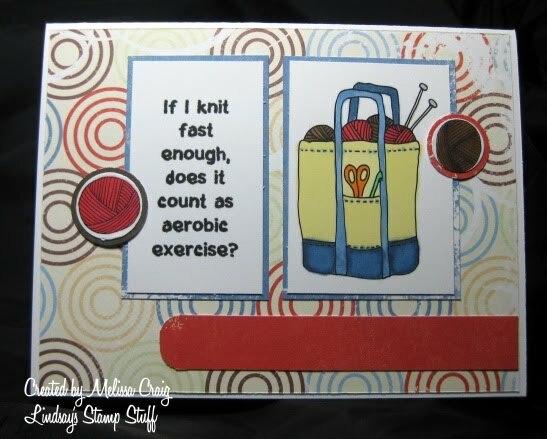 I found a quote on Quote Garden that says If I stitch fast enough, does it count as aerobic exercise? The author is unknown. So I changed the word to knit and used a font called Rita that if you look up close, the letters look fuzzy like yarn. I followed a sketch from Sketch Girl challenge blog. This was a really easy sketch which helped get this card together relatively quickly. 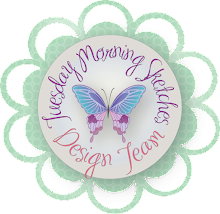 Please be sure to visit Lindsay for this week's freebie and then hop along to visit all the members of the Design Team - they have awesome projects to share with you! Thank you stopping by! Good Morning! 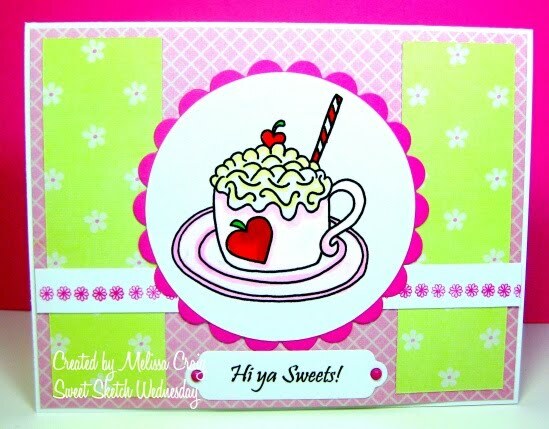 It's a Sweet Wednesday over at Sweet Sketch Wednesday. 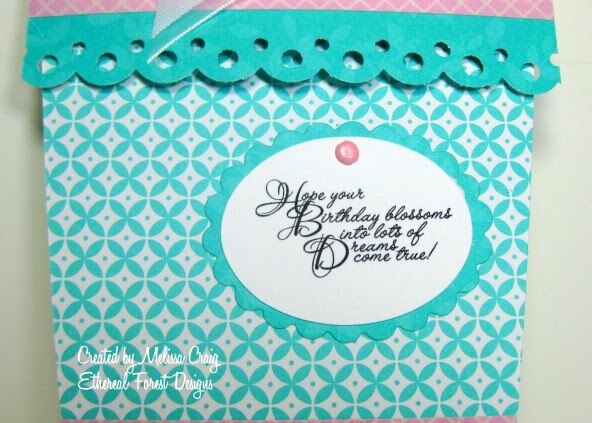 Earlier this week I had the privilege to share a card with you that I made using a Busy Beauties Boutique image. I am super excited that Carolyn is sponsoring SSW this week! I am not happy with how this photo turned out - my colors sort of got washed out. But with all the gray days, it was really hard to get a good photo. The image, Cuppa Sweetness, can be found here. I created the sentiment on my computer. Thank you for stopping by. Now head on over to Sweet Sketch Wednesday to play along. Good Morning! Happy Tuesday! 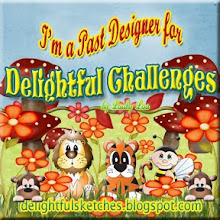 I just want to invite you over to my challenge blog to join us for another fun sketch and more fun. 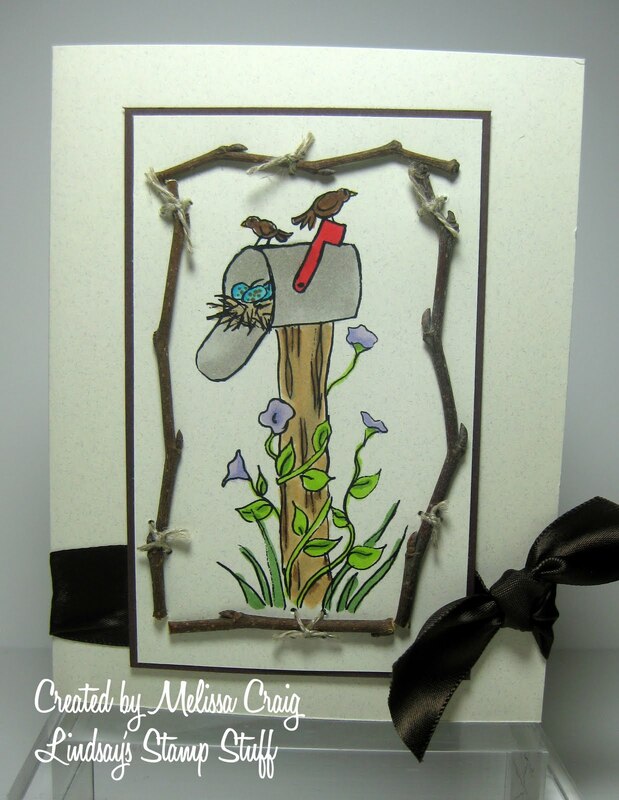 This week's sponsor is Lia Stampz, a brand new stamp company. The images are fun and funky. I used the image called I'm Not Sleepy. I created the sentiment using my own opinions about sleep. I do think sleep is a waste of time. There are other things I'd much rather do than sleep! Good Morning! Happy Monday. I do hope your week is off to a good start. The card I have to share with you today from Ethereal Forest Designs is the 2nd installment of sneak peek week. Darsie kicked it off yesterday with a stunning card! 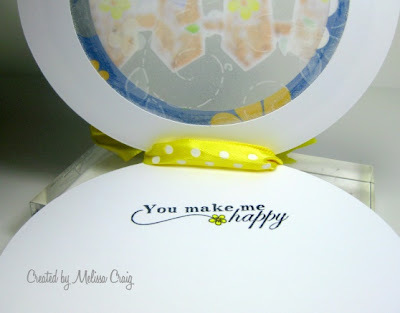 All week long we are featuring the wonderful sentiment sets so you can see just how versatile they are. They can be an accent to your card, but they do create a very pretty focal image. 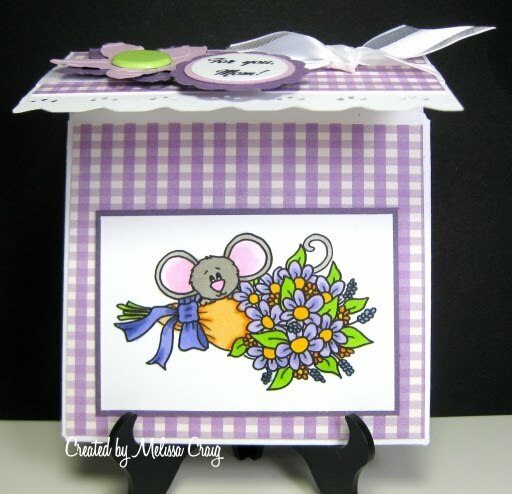 This image is from the All Occasions digi-stamp set. I colored the word "Sunshine" with a yellow Copic marker to highlight it. I also used flowers that I got from Michael's. They were regularly $6.99, but they were on the clearance rack for $3.99 - but when the clerk scanned them, they were only $1.99!! Can't beat that!! I also discovered another great place for SVG files. 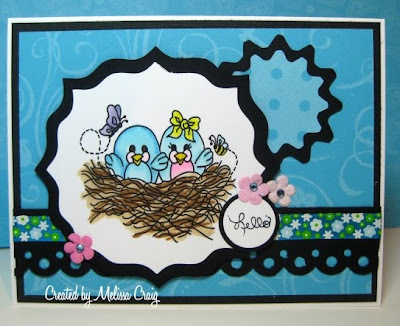 The black mat was created using a SVG cut found at Wanda's Cards and Crafts. I grabbed a few of her files yesterday to try them out. Fun! Thank you for stopping by today. I hope your day is filled with sunshine, smiles and a bit of inspiration. Good Morning! I love low key weekends. Actually, today will be a little busy with laundry to get done and Hollyanne has a dance class this afternoon. But I decided to treat the kids to dinner at a favorite (and cheap) place. 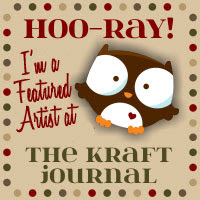 But Saturday was cold and rainy and a great day to stay in my craft room! Last night Busy Beauties Boutique had a release party and I scored a free image from the sweet, sweet Carolyn. So I set out to play. I also discovered that I could join her challenge, too. Although, I don't think my card turned out like rubbish, there are LOTS of scraps that should've been thrown away, involved. I followed the sketch from The Sweet Stop. I think this is probably the first time I've ever played along with their challenge and not used a Sweet n Sassy image. I think it's OK, just this once. Ha! I also added blossoms which fits the Our Creative Corner challenge. 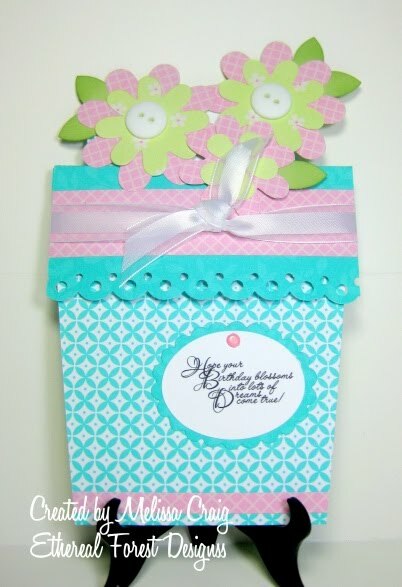 And as I mentioned, it fits Busy Beauties Creation Station challenge using bits of scrap papers and ribbon. Tools: SVG cut from Penny Duncan Creations, SCAL/Cricut, Martha Stewart border punch, 3/4" & 7/8"
I hope you like my card. I want to thank Carolyn for giving me such an adorable image to play with. Thank you so much for stopping by. I hope your Sunday is a blessed one. Good Morning! Happy Saturday! I'm excited to be off this weekend. It'll be a busy weekend, but I am happy to just be home and with my kids. I just finished up a couple of cards that I want to share with you. 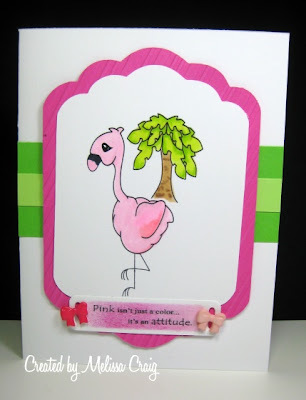 The first card is for Inktegrity's Sketch Challenge blog. 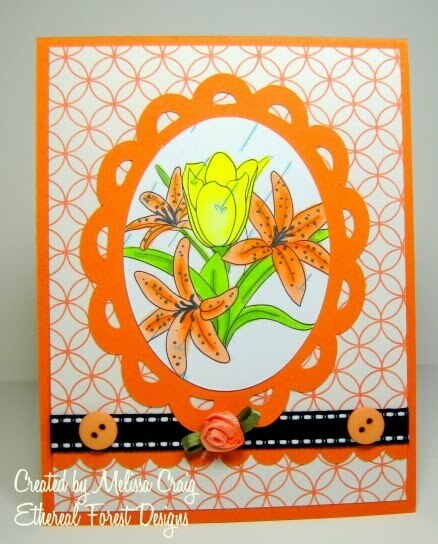 This was a fun sketch and I was able to incorporate another great SVG cut from Penny Duncan Creations. When I was on Inktegrity's design team, it was a great privilege to have access to Joni's awesome images. Well, as the winter team was leaving we got to request an image. I chose a unicorn, but fellow DT member Jeanette picked a flamingo. This is actually my first opportunity to play with Rico. This next card is for several challenges. I played along with Friday Sketchers (the sketch), Fussy and Fancy Friday Challenge (Quote me), Raise the Bar (Color Me Happy). I followed the sketch from Friday Sketchers, using a wonderful quote by John Leonard "It takes a long time to grow an old friend," and my favorite color is purple.... and polka dots. This card features Nora on a Swing from CC Designs. I hope you enjoyed by double feature today. Thank you so much for stopping by! Wow - it's Friday and I actually got to play along with another challenge. This time I followed the challenge from All That Scraps Wednesday challenge - which was to sew on your card. My machine still isn't working, so I hand-stitched this one. I am so pleased with how this turned out. 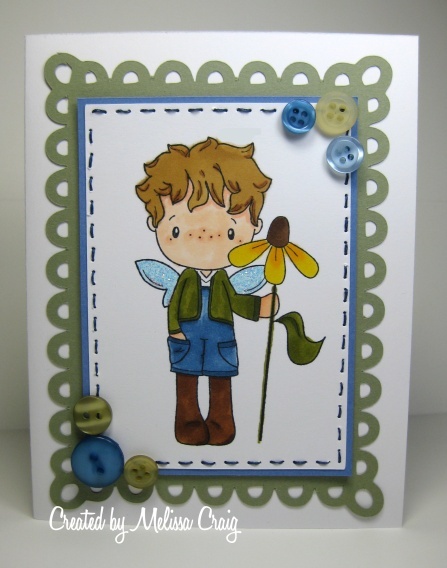 The adorable image is from the Spring Pixie kit from All That Scraps. It's funny, I have two boys but I rarely do any boy cards. This image just happened to fit exactly what I started out to do. Let me tell you about my little journey. I found a blog called Penny Duncan Creations. If you haven't visited her, YOU MUST! This woman is amazing with her digital creations. She has SVGs, digi-images, tutorials. Anyway, I found her blog and was enthralled by her projects. I downloaded some of her free SVG files and immediately set out to make a card. I started with her SVG cut which is the lacy mat beneath the Pixie image. Then I cut a rectangle to fit inside the mat. That just happened to be the perfect size for the stamp. Well, I originally cut the green mat as a test... it just happened to match the colors of some new buttons I picked up from the $1 bin at Michaels. 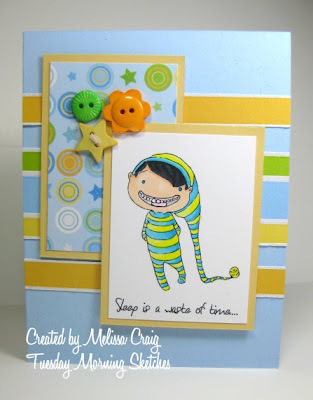 I love when things just fall into place to create an adorable card! Thanks for stopping by today! I'm glad you came. Good Morning! I hope you're all enjoying a great week. 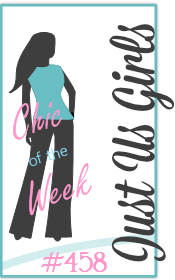 I know I usually have a Thursdays with Lindsay post on Thursdays, but she gave us the week off after the 3 day blog hop last week! So, I decided I was going to play along with a challenge that I rarely get to join in on. 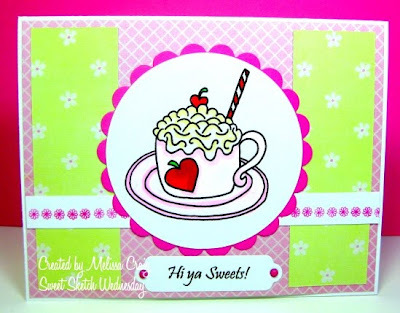 This card is for the There She Goes challenge, which was to create a card featuring a tag. I also finally got to ink up a favorite TSG set that my sister sent me months ago. I created a very clean and simple card and I just love how this turned out. The stamp set I used is called Polka Dot Blooms. The sentiment is from All That Scraps. I even found this cool button in a package of buttons I got out the $1 rack at Michaels. 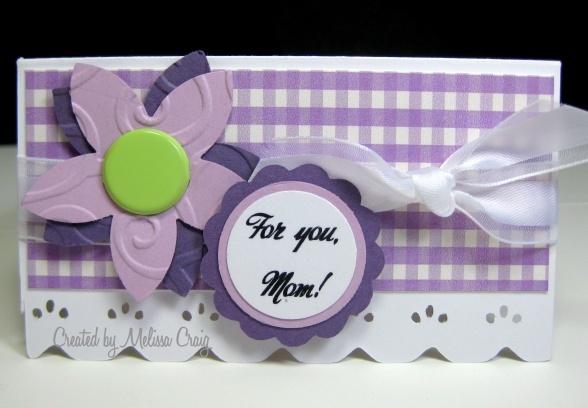 It's a rectangle button that I sewed on the card and ribbon. I hope you like my card! Thanks for stopping by. Good Morning! Welcome to a new week for Sweet Sketch Wednesday. 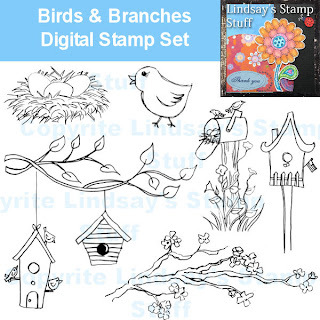 This week is sponsored by another monthly favorite - Sally Ann from Digi Stamp Boutique. I absolutely loved this sketch! I really like every element there is to it - and it gets even better when you have an awesome image to work with. Sally Ann shared Lucas and Flower with me and I want to be sure that I express my gratitude. Isn't he just too cute for words?! I had so much fun putting this card together - I hope it brings you just as much enjoyment that it did for me. 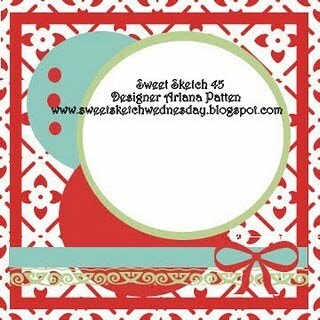 I hope you hop on over to the Sweet Sketch Wednesday blog and join us this week. Arlana has all the details there on how to play. You'll also get a lot of eye candy and inspiration from the team. Have a Sweet Wednesday! Good Morning! Another day off... laundry is done - so I have a day that I can craft away! Gotta love that. 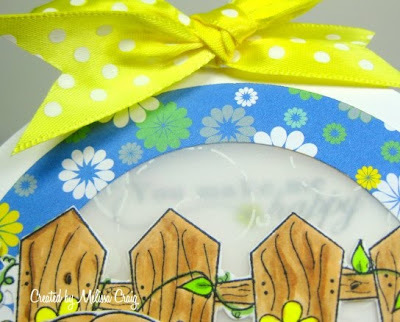 I just have a quick post today to invite you over to my challenge blog. We've got another great sketch - my sister Theresa designed this one and it's a challenging sketch. This card also sums up my attitude about today. Ha! Theresa is sponsoring the challenge this week as well offering a fabulous prize. She's giving away a Close To My Heart stamp set! I would say that I wanna win except that would be greedy, since she's already given me some fabulous stamp sets already. This one is called Summer and I would love to be in a hammock with a tall cool drink in my hand! Paper: Tempting Turquoise dp from SU! I hope you join us this week! Thanks for stopping by! This was a great sketch to play with. I'm not sure I did it complete justice, but I do like how this came out. The Color Chef challenge was to use Orange, Turquoise, Gray and White. So I pulled out a favorite Cocoa image and some great digi-paper from Two Peas in a Bucket and had lots of fun. Thanks for coming by again. 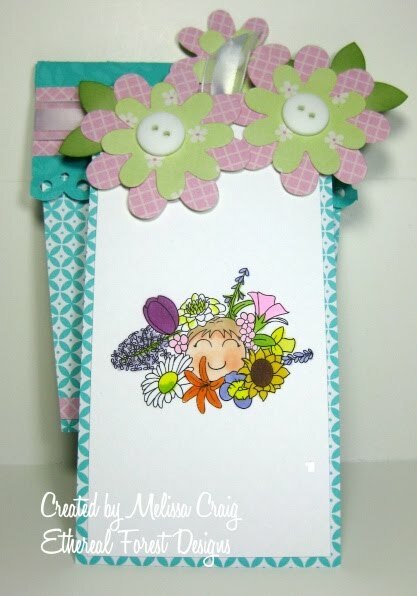 And if this is your first visit today to my blog, please scroll down for my Ethereal Forest Designs post - I made a flower pot pocket card which came out really cute, even if I do say so myself. Good Morning! I just worked 5 days straight - which I realize is pretty normal. However, that is 5 days on my feet the entire time and running around, lifting people, on and on and on... I am pretty tired and looking forward to being off today and tomorrow. My aching feet need the rest. LOL!! Anyway, I have a really fun card to share with you. My monthly card group challenge card was to create a flower pot pocket card. This was a fun card to make! I incorporated a couple of great images from Ethereal Forest Designs and I am happy with how this card turned out. So here's the front of the card. Isn't this design cute!? And here's Jewel peeking through the flowers. This is one of my very favorite images from the April release. I hope you like my card. I want to make a bunch of these and share them with my senior friends at work! Thank you so much for stopping by! Happy Friday to you! We're in for another beautiful day here, I am so happy!! After the cold and rain on Tuesday, I've enjoyed the weather warming up. 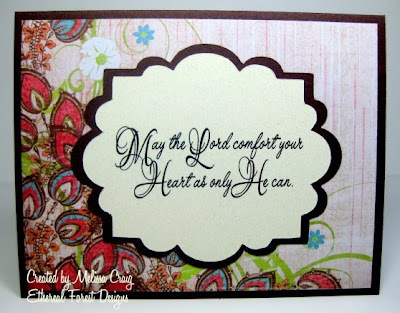 The card I have to share with you today is last week's challenge from All That Scraps Wednesday challenge. I posted in on SCS to be able to play along, but this is my first chance to share it here on my blog. I'm going to try to play along with their newest challenge this afternoon when I get off work. As you can see, the back panel is vellum. I found a very, very old piece of vellum in my stash. This I got from SU! when I went to convention...12 years ago! Talk about hoarding! You can kind see the sentiment showing through. Here's the inside view of the card. All these stamps are from the new CC Designs Spring Swiss Pixie kit. Love it!! I took this picture because I thought it would be easier to see what colors I used, instead of listing them. I had to laugh at myself - I actually forgot a marker in the photo! Thursdays with Lindsay - Anniversary Blog Hop! Good Morning! Happy tax day! OK - I'm not real thrilled about it either, but... Let's talk about something really exciting. Today is the 3rd day of Lindsay's Stamp Stuff 3 day Anniversary blog hop. There's been a crop going on in the MyGrafico Virtual Crop Room. There's been prizes. And everything is 50% off at Lindsay's MyGrafico shop. If you came here from Rhonda's blog (fabulous project, eh?!) then you're on the right track. If not, start at Lindsay's blog here. 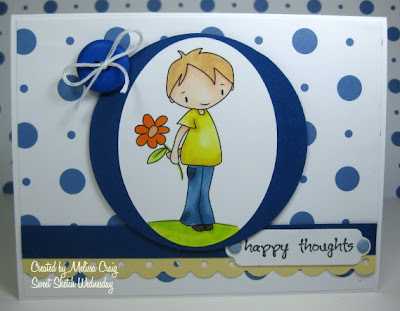 I kept the card clean and simple because, well, simply put - the focal image was hard enough! I went out to my backyard and found some really cool twigs. I then cut them down to create a frame around the image. I used an image from the Birds and Branches set. 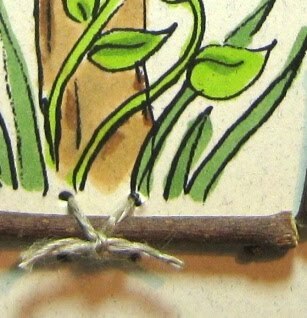 I then glued the twigs down but then to secure them I used twine and a needle to tie them to the card stock. I'm not pleased with this photo because it makes the ribbon look black, it's actually a rich chocolate brown. 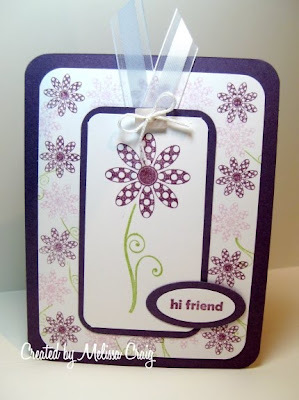 This card also fits the challenge over at KL Stampin' n Scrappin' blog. I have a give away, too. 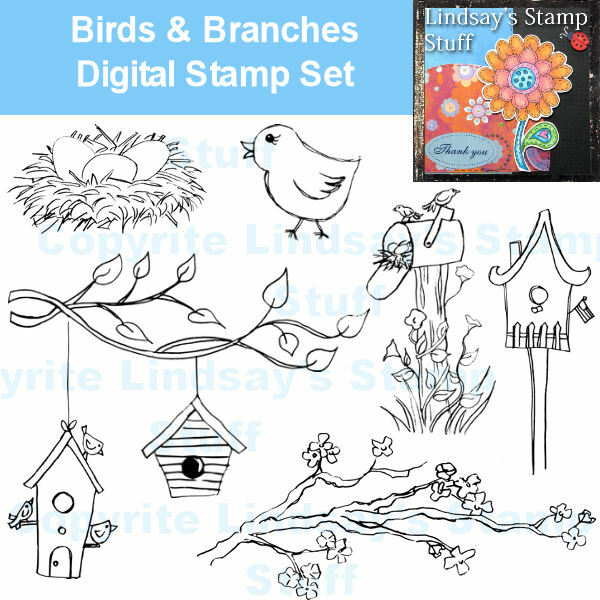 One lucky commenter on my blog today will receive the entire Birds and Branches set just by leaving me a comment. You don't have to become a follower if you don't want to. 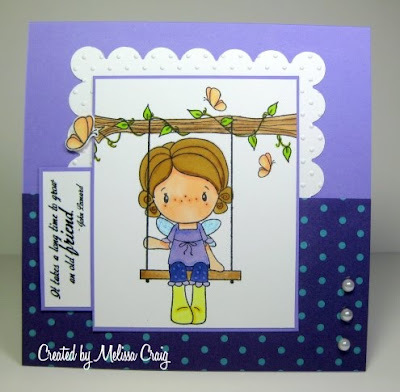 Now on to your next stop on the blog hop which is Cassandra. Have fun on the hop and have fun shopping! Good Morning! It's time for another great sketch from Sweet Sketch Wednesday! Arlana always comes up with the greatest inspiration in her sketches. This week's challenge is sponsored by one of our favorite returning sponsors, Fresh Brewed Designs. Heather has such sweet images! I fell in love with this image, it's called Buggy Naptime. I hope you like this card. I had fun making it! 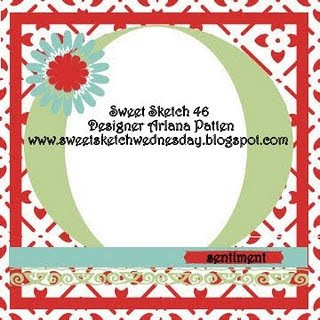 I hope you join us this week so hop on over to Sweet Sketch Wednesday to see more great cards from Arlana and the team and to join in the fun! Thanks for stopping by. Good Morning! I am so excited - I'm off work today and I have the house to myself. I'm going to be stamping my little heart out!! LOL But for today's post, I'd like to invite you over to my challenge blog. 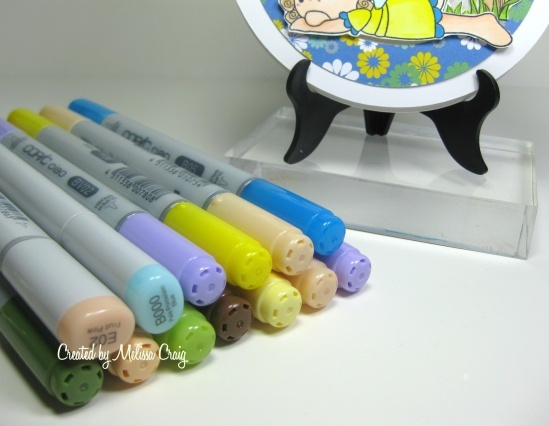 I have a recipe challenge for this week and we are sponsored by Doodle Palace. 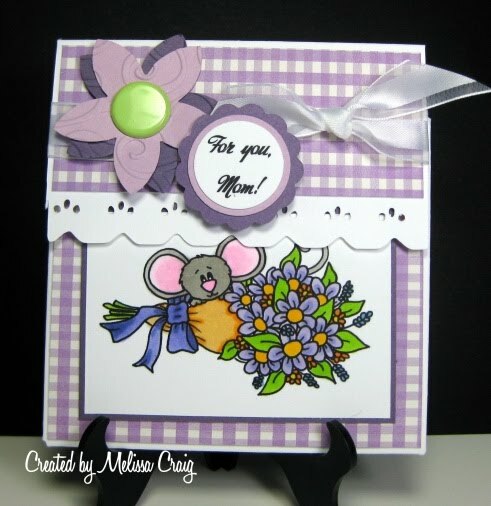 The challenge is to use soft hues, flowers and ribbon. I'm not exactly sure when this card took on the persona of a Father's Day card, but it did. Since I don't have a Dad anymore to make such a card for, I guess I'll just have the kids send this their dad. My sister sent me some Unity Stamps that are all about Dad, so I used one of the sentiments from that. I think she sent them to me intended for a prize. Ooops! I do hope you'll join us over at Tuesday Morning Sketches. See you there! Good Morning! Happy Monday to you! The reality of this is, my post was set on auto-post because I had to be at work at 6am this morning. 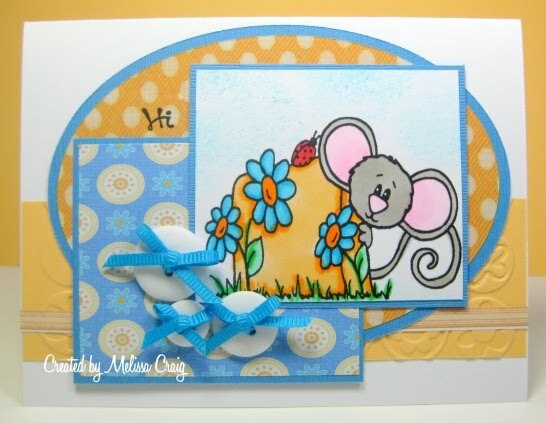 Did you catch the EFD blog hop yesterday? If not, there's still time to have a chance at winning a $10 voucher to store. Scroll down to get the line up. Today's card is a very clean and simple card. OK, the real story is, when I sat down to create something... anything on Saturday, it all turned to yuck! I definitely wasn't feeling my muse. But finally I got this card together and I am happy with how it turned out. I love having words as the focal point of a card. And with this message, it seemed to add anything else would detract from the card. Whether it's the loss of a loved one or just feeling a bit of heartache, this card says it all. I picked some great paper to bring the design element into the card. What I am really excited to tell you about is that I used an SVG shape that I got from SVG Cuts for free. This is a great set designed by Mary Rudakas. A very talented SVG designer. I printed the image out first. Then I cut a piece of scrap card stock using SCAL and the Cricut with my chosen shape. Then I removed the cut out shape (positive) and set that aside for later use. Using the negative of the cut out I placed my image behind the opening and positioned where I wanted it to cut and then carefully placed it onto the cutting mat and pressed firmly. I then removed my negative piece and put the mat back into the Cricut and cut the shape again. I hope that made sense - but I am feeling another tutorial coming on! Let me tell you, I have been known to be laying in bed thinking this out. 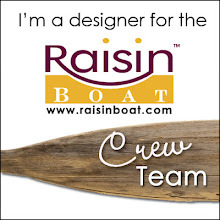 How I could use digi-images with SCAL/Cricut tools? I am thrilled that I got it to work out just the way I wanted it. I do hope you like my card. And check back - I may just have to do a tutorial on how to do this technique. Thank you so much for stopping by. Ethereal Forest Designs 2nd Blog Hop! 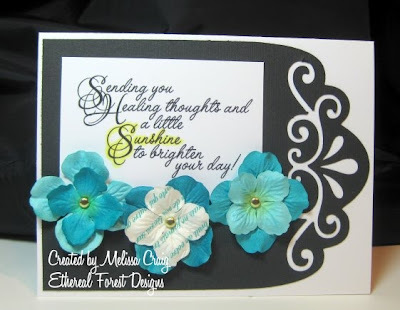 Welcome to the Second Ethereal Forest Designs Blog Hop!!! If you just happened to drop by my blog and you are not aware of this wonderful event taking place, please go back to our Design Team Coordinator, Darsie Bruno’s Blog HERE and start your hop! Along the way, please make sure you comment on each one of the design team members blog, then return to the Ethereal Forest Designs blog and make a comment. At the end of the hop, one lucky winner who has commented on all the blogs will receive a $10.00 voucher to the Ethereal Forest Designs Store. Here is a list of the blog hoppers in case you lose your way. The winner will be announced on the Ethereal Forest Designs blog on Friday, April 16th. Deadline to complete the hop will be Thursday, April 15th!